Walking into The Camfield, the first thing you notice is how perfectly this Perth pub compliments its surrounds. It has a familiarity to it that almost makes you feel as if it’s been there forever—until you notice the sharp details and exceptionally fine finishes, which speak to a design wanting to impress and delight. The Camfield is brought to us by Three Pound Group, the crew behind The Stables, The Reveley and The Globe—so you know you’re in for somethin’ special. Utilising a pre-existing building—the old Burswood Golf Club—but featuring a distinctly modern addition at its western end, the establishment hosts multiple bars, including a container bar providing great views over the precinct, as well as a microbrewery and a variety of different dining areas. 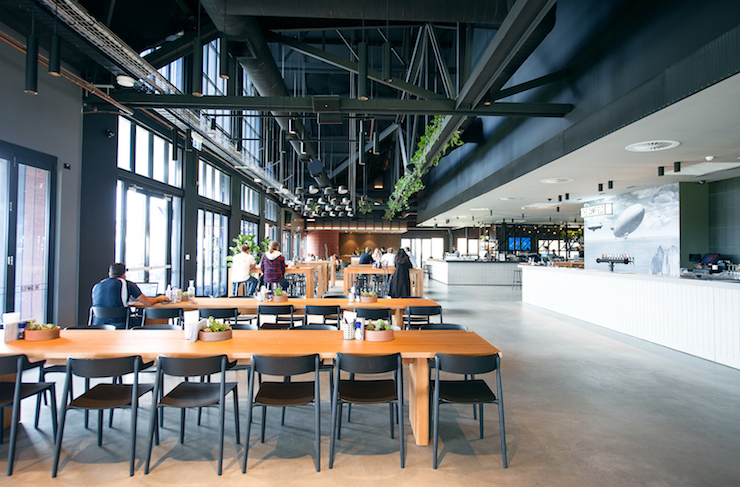 For a pub with the capacity to hold 2,500 people, the building is hardly imposing, allowing views of the stadium, the river banks and the Perth City skyline to be enjoyed from throughout the venue. With the furnishings taken care of by Mobilia, The Camfield is about as trendy as a pub can get—think low slung, olive green chairs scattered around tables for four, and heavy wood high tables with swivelling, powdered black stools catering for bigger groups. You’ll barely even want to eat off the beautiful, matte black cutlery (seriously, they’re what dream house goals are made of)—that is, of course, until the food comes. While the extensive menu is well curated to ensure there’s something for everyone and every moment, it stays grounded with pub classics and wood-fired pizzas as the heroes. If you’re there for a pre-game meal, you might be tempted to stop at the pizzas (we wouldn’t blame you, they’re delish), but seriously: you want to try all the things. Worthy of a special mention is the incredible scotch fillet, cooked to a tee and dished up with garlic butter and crunchy zucchini chips that bring a lightness to the plate. The Angus beef burger wins prizes in the juicy department, packing in some serious flavour with lashings of smoked bacon, American cheese, mustard and pickle, and the finger-licking good buffalo chicken wings are also an instant favourite. The slow cooked Amelia Park lamb shoulder, which cooks for twelve hours before being served up to customers, falls apart just right and comes paired with grilled eggplant and harissa. And, if you’re one of those people who judge a pub by their chicken parmi, you won't be disappointed! Theirs is cheesy and crispy and comes with a side of moreish hand-cut chippies. For something on the lighter side, the roasted pumpkin risotto and Cone Bay barramundi are both satisfying dishes that resemble slightly more upscale dining, but still fit well into the laid-back menu anyway. 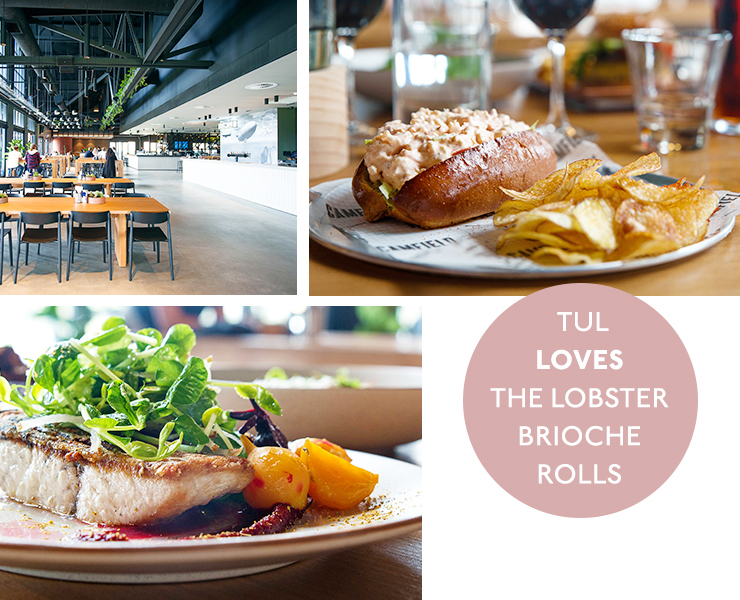 Also, don’t leave the place without tucking into one of their deliciously messy, rich and creamy lobster brioche rolls—not only will your taste buds thank you for it, but it makes for a bit of fun manoeuvring the thing into your mouth. Now, let’s return to those pizzas. The Camfield is home to a couple of WA’s largest pizza ovens that are so big it makes you wonder how they even got them in there. The pizzas they’re turning out are equally as big in flavour—go for the Fungi to enjoy a deep mozzarella taste with pungent bites of mushroom and truffle oil so tantalising that you just won't be able to refuse eating the whole thing. Their take on the classic Hawaiian has a bit of a gourmet twist, with shaved leg ham, sweet, juicy pineapple and scattered basil making for a definite go-to order that’ll please the whole table. Oh and those beers they’re brewing? They go just right with the pizzas, and if you like darker ales, theirs will top your meal right off. On to dessert—if you think you’re full, mind over matter people! You have to get that chocolate and salted caramel tart in front of you right now. It’s so smooth, sweet and luxurious, and perfectly balanced by the honey ice cream milk its served with. Also delicious for those who prefer something fruity for sweets, don’t go past the stone fruit and mascarpone, which comes with candied walnuts, milk crumb and nectarine leather and literally melts in your mouth.